In November, 2007, (Gray line) we entered Honduras from El Salvador at El Amatillo on our way to Nicaragua. We avoided Tegucigalpa and made a good choice to cross the border at La Fratemidad. This route was pretty with long climbs. then back to Gracias and regrettably returned to El Poy. At this time of year, this area was cloudy and cold. We climbed many mountains. There is very little flat land. It’s beautiful, the roads are good and quiet, the people friendly, it’s relatively free of crime. The biking was good but strenuous. Beyond Gracias the road deteriorates and we ran out of time because the mountains slowed us down. In 1992,(Red line) we basically traveled through Honduras, so we traveled but 300Ks from El Salvador to Nicaragua. The best part of this trip in 1992 was the quality of the roads which had just been rebuilt after a huge earthquake. It’s hot in the lowlands, the capital has a nice climate but is not interesting and the hotels and restaurants are generally basic. It’s of limited interest. 2007, the direct route from El Salvador to Nicaragua has good roads but the shoulders were narrower and sometimes broken. In 2006, we rode what was described as the best highway in Honduras. This highway runs from El Poy to Santa Rosa to San Pedro Sula. The side roads to Copan and then as far as Gracias were wide and well maintained.also being improved. In 2007, on the direct route across Honduras the traffic was surprisingly moderate. In 2006, the southwest, the traffic was light but there are some trucks. One issue was their disregard for cyclists, often passing too close. In 1992, the capital had terrible traffic. Outside of Tegucigalpa, the volume of traffic died down. Toward the borders with El Salvador and Nicaragua, the roads were quiet. November 2007, the temperatures were warmer than the previous year even in the mountains where we wore a light sweater at night. In the altitude in the southwest, the temperatures were low even in the day. At night, it was down right cold (below 10 degrees centigrade). Apparently, this is the climate from October to January but it was colder than usual in November 2006. In 1992, it’s hot and dry here. The sun at midday actually hurts. The rainy season is from May to October, but even then the rains are more infrequent here than in the rest of Central America. Tegucigalpa is at 975 meters and has a fresh and cooler climate. In 2007 the winds were strong from the northeast. In 2006, the winds were from the north and strong especially on the numerous mountain passes. Prevailing winds blow from the northeast, increasing in speed in the afternoon and occasionally bringing rain in the evening. In 2007, on the climb to San Marcos, the vistas were really great. The mountains of the southwest were beautiful. With the constant climbs come good vistas. In November 2006, we had fogged-in conditions high in the mountains on some days. Although not as spectacular as other countries in Central American, Honduras is a mountainous country and does offer some vistas and nice scenery. There are a lot of pine covered mountains. We used the Lonely Planet again in 2007. We got much more reliable information from the locals. We used the Lonely Planet in 2006 and got a tourist booklet in Copan that covered the main tourists’ places in the southwest of Honduras. We bought a general tourist map, which showed the roads, but the dirt roads appear the same as the paved roads. There was not a terrain indicator so we had to take it as it came. The information from locals was very unreliable. The tourist office map is useless. The Texaco map is difficult to find and AAA map details only distances. Getting a good map is a concern because at times villages and provisions are separated by climbs or difficult roads. There’s a chapter about biking in general in “Latin American by Bike” by Walter Sienko published by Mountaineers. In 2006 and 2007, because of the light traffic, the roads were safe. The only issue was the driver’s disregard of your space, so we rode defensively. In the capital, in 1992, riding is hazardous. The further you get from Tegue, the safer the roads. The roads we rode were well engineered and the traffic levels low, so the riding was good. The smaller cities of the direct route we took in 2007 seemed safe. We got few warnings from the locals. People were proud of how safe the area was in the southwest, in 2006. We never felt any concern, but we were warned in Santa Rosa to take care. In Teguciagalpa, in 1992, street crime was increasing, but still not overwhelming. The people are poor, so non-violent sneaky crime is a fact of life. Outside the capital, the risks decreased. In 2006 and 2007, the quality of food and lodging was average but the prices were correspondingly low. In 1992, the cost of living was low and the inflation rate was reasonable. The problem is that both the food and hotels are of a low standard. You pay very little, but the quality is very low even in the capital. In 2006 and 2007, bottled water was always available. Other drinks including Gatorade were available and cold. All drinks including beer were cold and OK. In 1992, bottled water was difficult to find except as refrescas (soft drinks). Don’t drink untreated water, including ice cubes. Amoebic dysentery is endemic. Refrescas and beer are both common but at times hard to find cold. In 2007, we got decent food at reasonable prices. In 2006, in the southwest, we found good basic food. Mexican restaurants have come here, also pizza. It’s not gourmet but it is passable. In the countryside, at times it was difficult to find even basic food. At restaurants it’s mostly basic and often poor quality even in the capitol. You get lots of fried chicken. Also, beware of gringo prices. In 2007, we found reasonably good rooms at somewhat higher prices. Not the best but at least the sheets were clean in 2006. Occasionally, the hotels, although old and warn, were about average. Poor quality generally in 1992. Hotels, pensions, hospedajes and hotelitos are all poor. Camping is hard to find. Proceed at your risk. In 2006 and 2007, we found the people very friendly and kind. For example, we had offers of rides up long climes. We never encountered the gang activity we had heard about. Honduras is a destitute country in 1992. The people are 90% mestizo. The people are struggling economically. This being said, their attempts at helpfulness were sincere , but their knowledge was slim. They see few tourists and treat cyclists as a great curiosity. The only small city on the 2007 trip that was of interest was Choluteca which has a progressive mayor (voted best in the country) and is renovating the colonial center. In 2006 we found the southwest is full of colonial towns and villages. Copan is a good archeological site, but it’s not on a par with Guatemala or Mexico. In 1992, Honduras is an unpretentious country. But there is none of the colorful customs of the Indian culture or the grandeur of the other colonial cities of Central Americas. 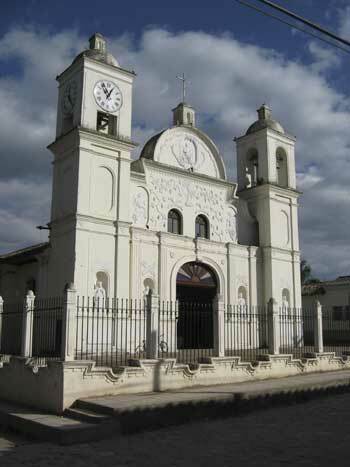 In 2007, only Choluteca was of historical interest. In 2006, the colonial towns and villages in the southwest are interesting and Copan is a very interesting Mayan ruin. In 1992, of course, Honduras has the same heritage as the rest of Central America. But there is little evidence of history. We missed the highlight: the Mayan ruins of Copan. Tegucigalpa offers for less than the other capitals of Central American in regard to historical sites. Hwy #1 (Pan American), 2 good wide lanes with a 1 meter shoulder. Light traffic. Good riding. OK scenery, road winds thru low mountains. Occasional moderate climbing. Traffic builds, trucks come through the border in late morning. NE winds (head). At 35Ks, Nacaome (there’s a new hotel on the Hwy). At 40Ks, junction right (left to Tegucigalpa). Slightly down, tail wind, fast, dull. Variable shoulder, often broken then (hold on to your hat) a bike Path at 48Ks . At 51Ks, veer right into San Lorenzo. Centro at 52Ks. 4Ks north of San Lorenzo, turn left (west) at Gas station. 22Ks of flat road with ranches then shrimp farms then mangroves then mountains. Good road. NE winds (tail). Quiet. At 22Ks , steep climb for 1K, then steep rolling hills. At 27Ks, down to Cayolito. At 30Ks, boat to Amapala on Isla de Tigre. You can ride around the island on a good dirt road. 1K out to Hwy 1 then right (east). 2-lanes, a somewhat broken shoulder. Mostly flat. NE winds (head). Moderate traffic but trucks come in clumps. So-so scenery. A few moderate hills. At 33Ks, turn right into town at 35Ks. Hwy #1 now very quiet with few trucks (they go to Guasaule). 2-lanes with shoulder. OK scenery. Wicked head winds (NE). Gradual climb for 14Ks on a straight road. Then climb to1300 meters at 38Ks. Big vistas all the way to the Pacific. Fluky winds in the mountains. Serpentine. Rolling hills down to 51Ks. Headwinds. No more vistas. At 51Ks, climb for 2Ks then flat into town at 55Ks. Rolling hills. Good quiet road. Lighter head winds today (NE). Out on Hwy 11, rolling up along river 2-lanes wide but no designated shoulder. Light traffic. At 16Ks, climb for 2Ks. Away from river then down to a valley. Gradual climb. Nice scenery. North winds (head) some rain in November. Again up the river. Less gradual for 2Ks then easy grades. No more river. Good views. At 37Ks start a gradual descent for 3Ks. 1K steep up then gradual again and then down at 43Ks. Some gradual, some steeper. Almost flat near LaEntrada, a couple mild hills into town 63Ks. Start climbing (road marker 105). 2-lanes sometimes a shoulder, which is actually like a wide 2-lane. Light traffic, some trucks. North wind (tail). In November it’s cold here. Mostly moderate climbing (5-7%) with some respites. At 20Ks, a fast 3K descent then climb again. Some rolling to 24Ks then climb, again. Top at 38Ks. More like rolling hills up for last 10Ks. At 39Ks, turn off for Santa Rosa. Good vistas. Down for 2Ks then up into old town for 2Ks. Old town has cobble stone streets. 43Ks. Back toward LaEntrada on Highway 4Ks then right at the PUMA Gas station. 3Ks moderate ups and downs then mostly moderate grades down 8Ks. Up 1K then 2 wide lanes. Quiet. Good Vistas. Steep and windy 8Ks down to river valley at 23Ks. Up and down 1 to 2K hills. Very good scenery. The hills become shorter and less steep as you go. North wind (tail). At 45Ks, cross the river and gradually climb into town for 6Ks. Into Gracias at 51Ks (cobble stone streets). 1K climb out of town then 9Ks mostly steep down. Good views. 2 wide lanes. Some rough parts and some pot holes. Light traffic with some trucks. At 10Ks, cross river and climb 3Ks of rolling hills then climb 7Ks. Mostly moderate then down (167 road marker) to a river at 30Ks. Then rolling. Strong north wind (tail). Narrow road at times. Light traffic. At 37Ks, start up a narrow river valley. Easy rolling hills. Pretty. The valley widens out. At road marker 203 start climb for 16Ks windy and long. Lots of wind. Top at road marker 218. About 2000 meters. Down mostly steep some gradual. Lots of curves. Descend for 20Ks into Nuevo Ocotepeque then rolling to El Poy for 8Ks. El Poy 95Ks. All the roads in Honduras are excellent. Smooth, no traffic and well engineered. It’s ___Ks to Jicaro Galan and the intersection for Tegucigalpa (6Ks past Nacaome). No major climbs and easy grades. Highway CA5 heads north to Tegucigalpa from the hot coastal plain to the pine covered hills around the capital. At an altitude of 975 meters, Tegucigalpa has a fresh and pleasant climate and is much cooler than the coasts. First climb for 60Ks. Excellent road, well engineered, and little traffic. Traffic increases, however, toward Tegucigalpa. 17Ks down into Tegucigalpa. Finally a four lane road. Tegucigalpa sprawls over the pine covered hills. Up and down into town. Four lanes out of town to a four lane highway (follow signs to Danli). Good road. 15K climb then with little traffic down 20Ks into a valley. Continue in and out of small valleys. Another long climb up for 15Ks and finally a slight down into Danli. There’s sugar cane and tobacco grown here. South out of Danli. The road is poorer but has little traffic. Mostly easy riding to El Paraiso (29Ks) but there’s a 5K climb to the border at Las Manos. It’s a poor road.